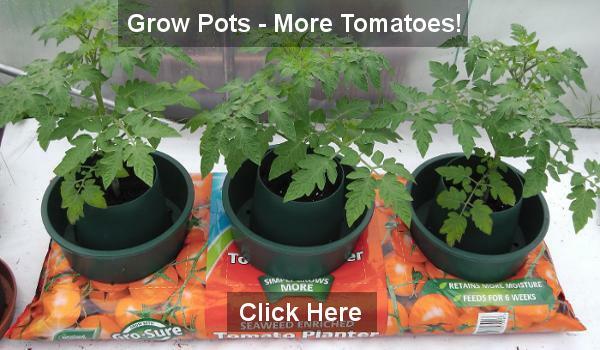 Welcome to Tomato Growing in containers and grow bags where you will find help and tips on how to grow tomatoes in containers of all shapes and sizes. Large Red Cherry, Beam’s Yellow Pear and Black Cherry tomato varieties. Tomatoes can be grown in soil, potting compost and other types of media too, such as… coir, rockwool and perlite. By adding perlite to soil for example, we can increase the water holding capacity of containers, grow bags and hanging baskets to help the soil from drying out too quickly. Cherry varieties are usually among the first to mature and easiest to grow, so I’ve included quite a few of these on the website. For those who prefer larger fruit, there are plenty of tips on how to grow salad and beefsteak varieties. 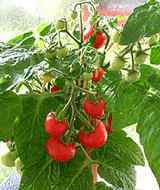 These are a little more difficult to grow than cherry tomatoes, especially in a short season area such as the UK, but good results can be expected with the right growing methods. More about growing large, beefsteak tomatoes here. Sowing tomato seed at the right time for your area, will always improve the chance of success! 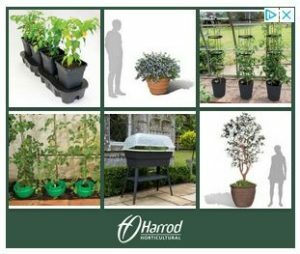 You can grow your own tomatoes outside in pots & containers (you don’t need a greenhouse or conservatory) and growing cherry tomatoes can be done on a balcony, in a window-box or even inside on a sunny windowsill. 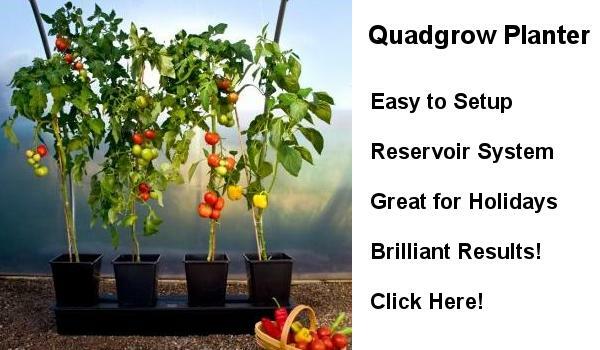 So, if you would like to discover real tomato taste, and be able to eat your own home-grown for up to four months each summer, then I hope you’ll browse these pages and have a go yourself, at tomato growing. Three Blight Resistant Varieties (below) – Worth a try if you suffer from blight regularly! The short answer is around two months before your last frost date. The seed sowing period in the UK is from the beginning of March to the end of April but it is possible to sow up to the middle of May if you choose an early or vigorous cherry variety. Buying tomato seedlings at a garden centre a little later in the spring, is also an option. Ordering seedlings online is also an option, however, there is a greater choice of varieties when starting tomatoes from seed and it’s a lot more fun too! More on when to sow tomato seeds. 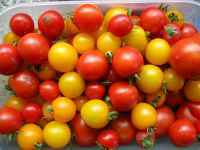 Crimson Crush Tomato Seeds – a truly Blight resistant large tomato variety. 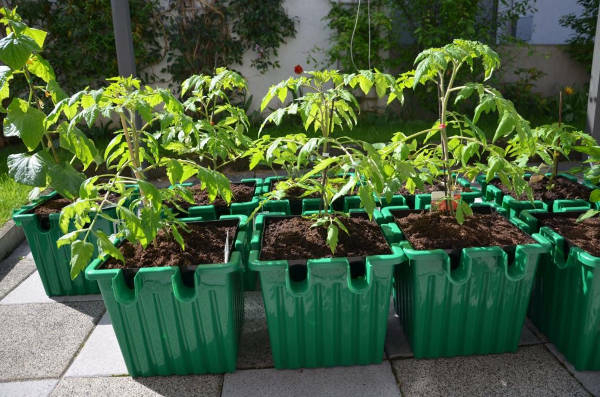 The Oasesbox Self Watering Planter – great for growing tomatoes – now made from 100% recycled plastic. If you are new to growing tomatoes, it’s a good idea to start with an easy variety to grow. Bush types are sometimes called “determinate” and do not need their side shoots pinched out. Bush varieties grow well in containers and large pots so they can trail over the sides, or in an upside down planter such as a topsy turvy. Trailing and Tumbler varieties include, Tumbling Tom – Red and Yellew, Tumbler F1 and Hundreds and Thousands to name just a few. These are also great for hanging baskets. There are two types of bush variety. The trailing bush types (Tumblers) that do as their name suggests and the upright, compact dwarf bush varieties such as Sweet ‘n’ Neat, Vilma and Balconi Red or Yellow. These will need some support. Gardener’s Delight, Moneymaker and Golden Sunrise have been around for many years which is a sign of their reliability. Gardener’s Delight, a decent size cherry, is highly recommended for flavour and crop yield. Moneymaker is also very reliable but there are a few new varieties that will give it a run for its money! Such as Orkado F1, Nimbus F1 and Tamina. F1 means that the tomato variety is a hybrid and usually more vigorous than an open pollinated variety. They are all very dependable. Tall varieties are also called “indeterminate” or “Cordon” because they don’t grow to a specific height and are stopped by pinching out the main stem. 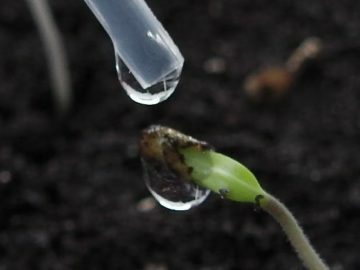 Cordon means that the trusses of fruit will grow from one main stem, but it is possible to allow two or three stems to develop from the side shoots or suckers. Tall varieties need support and are best grown in a greenhouse or outside, up against a garden fence or wall. 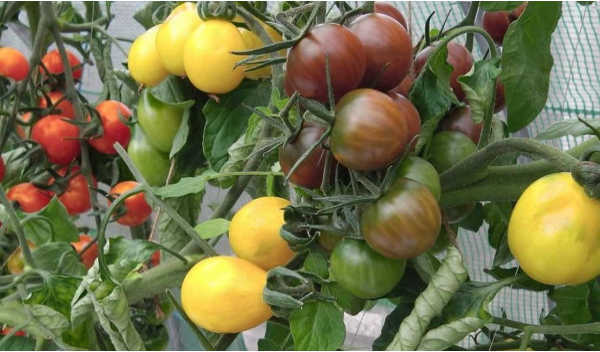 More about tomato varieties and the benefits of growing tomatoes in a greenhouse. One of the biggest advantages of the container is that it can be filled with fresh potting compost that is disease-free. also cause unseen problems that will reduce your crop! Some plants are like long distance runners – tomato plants are sprinters … they have a short time in which to produce a lot! This means that everything has to be right for them to grow quickly without obstacles of poor growing conditions and diseases. 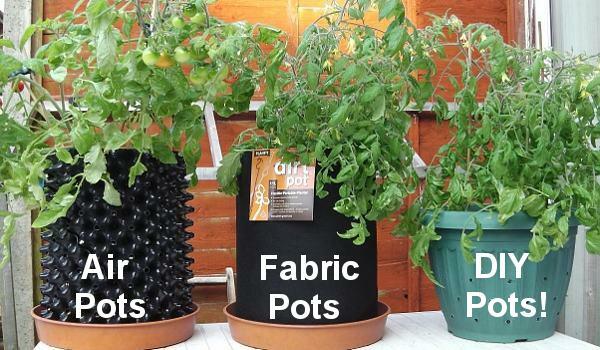 Grow bags can be upgraded and improved by using grow bag pots (see below) that improve the watering and feeding process. A reservoir system, such as found with the Quadgrow Planter (below), can be used to provide water and nutrients 24/7 – great for holiday watering too! Tall, indeterminate varieties are best grown in pots at least 9 inches in diameter or grow bags. 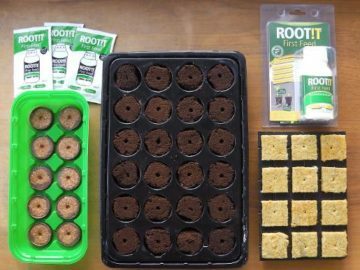 Using grow bag pots, also known as ring culture, is a very good way to grow tall varieties as they can be fed and watered through the different rings. Inner ring for feed, outer for water. More about containers for tall varieties. Side shoots grow out between the main stem and leaf branch (see photo left) and are best removed for the earliest harvest. Leaving a side shoot to grow on a tall variety will produce an extra stem, more trusses and potentially more tomatoes, but if you live in a short season area such as the UK, the first tomatoes may mature later in the season and you’ll end up making green chutney! Removing side shoots is standard practice on tall varieties – more about removing side shoots. The secret to feeding tomatoes is “little and often” especially when plants are in fruit. A good way to do this is to give half the recommended dose twice as often when watering. This means that food is available for plants more frequently – more about feeding tomatoes. How much water to give depends on many different growing circumstances including the size of plants and temperatures to name just two. It’s important that roots receive both water and oxygen so saturated soil for too long will cause problems – more about watering tomatoes. This is one of the most popular and convenient ways to grow tall (indeterminate or cordon) varieties and there are plenty of tips on how to optimise a grow bag to get the best crop of tomatoes – more about growing tall varieties in grow bags. 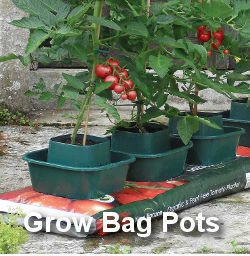 Grow Pots – recommended for all gardeners who use grow bags! This is a reservoir system that absorbs water and nutrients through capillary action, up into the pots. It is very effective and the plants can take in water and nutrients whenever they need them. This helps avoid Blossom End Rot and tomato split as there is always access to moisture containing nutrients. Plants are watered in trays by a valve that produces a wet/dry cycle. This has all the benefits of the reservoir system but with access to a larger water supply. 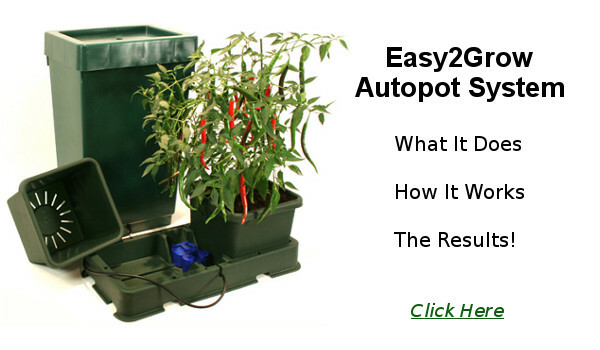 Get more information about the Easy2Grow Autopot System Here. Many of the problems associated with growing tomatoes are caused by over-watering and over-feeding. We want to be generous to our plants so they’ll grow quickly, but it’s easy to “kill them with kindness” and slow their growth down in the process! The best advice is “less is more”, at least until plants begin to flower and fruit – then you can be a little more generous with watering and food – more about tomato problems. Here are a few tips to avoid the problem. Blossom End Rot is caused by an interruption to the water supply in the plant’s system owing to the hot weather – sometimes tomato plants can’t absorb water fast enough when it’s very hot. However, the root cause of BER is calcium deficiency as the fruit is swelling owing to short periods without enough water containing calcium. Over feeding reduces water intake, so for maximum root absorption, feed tomatoes at half strength every other watering and try to reduce the temperature in the greenhouse by ventilation and covering dark surfaces that will give off heat, with white plastic. Also, removing the lower leaf branches below the first truss reduces water evaporation from the plants – the fewer leaves a plant has, the less water it loses by evaporation (transpiration). In my part of the world, last season was better than average. Those who sowed their seed a little too early struggled because of periods of poor weather in the early spring. However, the new variety Mountain Magic made coping with periods of wet weather, and the onset of blight, much easier. The popular favourites such as Black Cherry, Sungold and Red Alert produced an excellent crop – and the larger varieties did well in the hands of the experienced growers. Many tomato varieties are best suited to the weather conditions of the countries and regions from which they originally came or areas they were developed to be grown in. Siberian can cope with lower temperatures because it was developed that way – the name says it all! Moneymaker is an old English variety that excels in a moderate climate and is very reliable. Marmande originally came from France and requires the weather of the Southern Mediterranean to reach its full taste. So if you grow tomatoes outside, choose varieties that will cope well in the weather conditions of your area. You may also wish to choose a selection of varieties such as a cherry, a medium/salad and a large/beefsteak variety for slicing or the barbecue. Some large tomatoes can be eaten like melons they’re so juicy! Medium size fruit – are sometimes called salad tomatoes. Cherry size fruit are great in curries and pastas and enhance the visual look of a salad … not to mention the taste! Bush varieties are great to grow in large pots and containers and can be positioned almost anywhere around the garden or patio without needing a wall to lean against. The plants themselves can be small or large (as well as the fruit) so a pot on a windowsill or a large container may be required. A Selection of Tumbling Tom red and yellow, Maskotka and Garden Pearl (below). Choosing which varieties to grow each season is one of the most enjoyable jobs to do in the Autumn and Winter. You can browse the seed catalogues, or surf online where you will find a huge number of tomato varieties from different seed companies. Seed Sowing Time – March to end of April (UK). You can sow up until the beginning of May if you choose a variety that matures early, or you have a greenhouse. Even when growing tomatoes outdoors, always germinate seed indoors and in new seed or potting compost. This will get the seeds off to the quickest start without the possibility of disease lurking in old soil – tomato seedlings are very vulnerable at this stage. To produce a crop of ripe tomatoes, seeds need to be sown around two months before your last frost date. They can be planted out when the risk of frost has past. It takes around two to three months from sowing to flowering, and two to three months from flowering to fruiting … depending on the variety. Therefore, sowing at the beginning of April will produce fruit from the beginning of August – if you grow a quick maturing variety. A greenhouse will enable an earlier start and a later end to the season – a great way to increase your crop and have ripe tomatoes available for longer. My own preference is to sow indoors and get the seedlings established first, before planting them out in the greenhouse. The great thing about a greenhouse is that your plants are protected from rain and temperatures remain slightly higher. Go for the biggest greenhouse you can afford , or have room for, as very small ones can create a lot of condensation – try to let the air circulate. Cherry bush varieties are ideal for sowing early as they are easier to manage (movable in large pots) because of their size and height. You can also sow as late as May (in the UK) if you choose a variety that is quick to mature such as Red Alert. Stages in the Life of a Bush Tomato Plant. A propagator with lid is a very useful item. You can sow a few seeds in each cell and the air humidity beneath the lid helps the seedlings discard their seed shells or husks. As the seeds germinate they produce their first leaves called seed leaves. In the pic above the seedlings are removed from the cells and planted into individual pots. Transplant so that the leaves are just above the soil surface. In the pic above, the first true leaves are beginning to grow. This is the time that I like to give them their own home! The seedlings grow and after potting into larger pots, about six weeks later you will see clusters of flower buds forming on the end of leaf stems. Removing side shoots from bush varieties is unnecessary. This is the behaviour of a bush variety. However, tall, also called indeterminate or cordon varieties grow their flowers on trusses off of their main stems. The flowers open and when they begin to die away, they are replaced by pea-size fruit. As the fruit grows to maturity the tomatoes ripen. This is Micro Tom, as its name suggests it is a very small variety but great to grow on a sunny windowsill. Vilma is also a great variety for small spaces.